Sienna and the wines of the Colli Senesi with Tuscan Wine Tours. Sienna was an ancient Etruscan town and in the Middle Ages was the great rival of Florence until its fall in the 16 C. During the Renaissance and also later, Sienna produced art and architecture in quantity and quality far out of proportion to its small population. 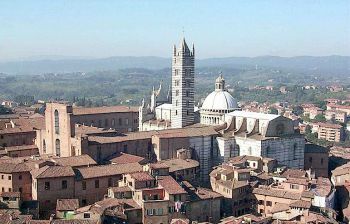 It is thus second only to Florence as a Tuscan "art city" and is much easier to explore due to its smaller size and the lack of traffic in the historical centre. Siennese cuisine still offers specialities from former times such as panforte, ricciarelli and cavallucci. Sienna, one of the most beautiful cities in Tuscany, is is divided into 17 districts (contrade) many of whose inhabitants spend the entire year in preparation for the Palio horse races that are held twice a year on 2 Julyand 16 August. While Florence is a great Renaissance city, Sienna is much more a Gothic city, characteristically combining brick and stone in its great structures, with the pointed double arch prominent, many windows and merlons (a type of ornamental battlement) at the top of its buildings. The vineyards in the hills surrounding Sienna lie partly within the Chianti wine zone, and include Chianti Classico as well as Chianti Colli Senesi which often has a lower alcohol content than Chianti Classico. Slightly further afield in the Province of Sienna are the famous vineyards of Montalcino (Brunello di Montalcino) and Montepulciano (Vino Nobile di Montepulciano), as well as San Gimignano where one of the few notable white wines of this part of Tuscany is produced - Vernaccia di San Gimignano. 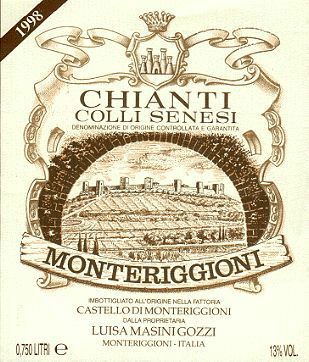 The Colli Senesi region tends to be hidden in the shadow of the well known DOCG regions of Brunello di Montalcino and Vino Nobile di Montepulciano, with much of the best Sangiovese going to those wines, so that the Colli Senesi region rarely appears on wine labels that are exported out of Tuscany.